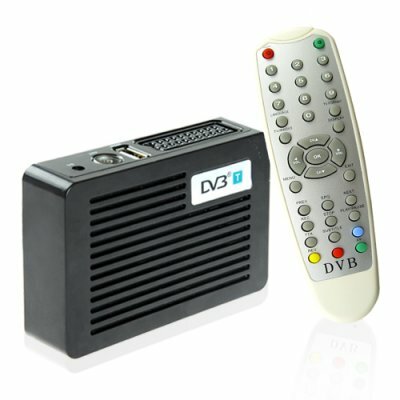 Successfully Added SCART DVB-T Receiver - Digital TV + Digital Media to your Shopping Cart. Deluxe version DVB-T receiver with SCART connection. Attention European customers; nothing could be easier than the plug and play ability of this SCART DVB-T receiver. If you want to watch digital TV on your old analog TV setup, then all you have to do is plug this into the SCART connection on your existing TV and you will be ready for the digital switchover! The CVSB-984 deluxe SCART DVB-T receiver has a remote control and slots for additional digital media, something you do not get with a generic DVB-T receiver box. This receiver can also be used with SCART capable standard LCD monitors. Don't be left in the dark, order yours today! Note: This unit uses a SCART connection that is used primarily in Europe. Please check your connections before you purchase this item. This unit requires an antenna input for best results..